An hour’s drive north of Chennai, Larsen & Toubro’s shipyard at Kathupalli sprawls over 900 acres, a spacious, modern facility very different from the cramped precincts of defence public sector undertaking (DPSU) shipyards like Mazagon Dock Ltd, Mumbai (MDL) and Garden Reach Shipbuilders & Engineers, Kolkata (GRSE). A fortnight ago, Kathupalli delivered to the navy a Rs 468 crore (4.68 billion) floating dry dock (FDD), which is now operationally deployed, repairing naval warships in the Andaman & Nicobar Islands. 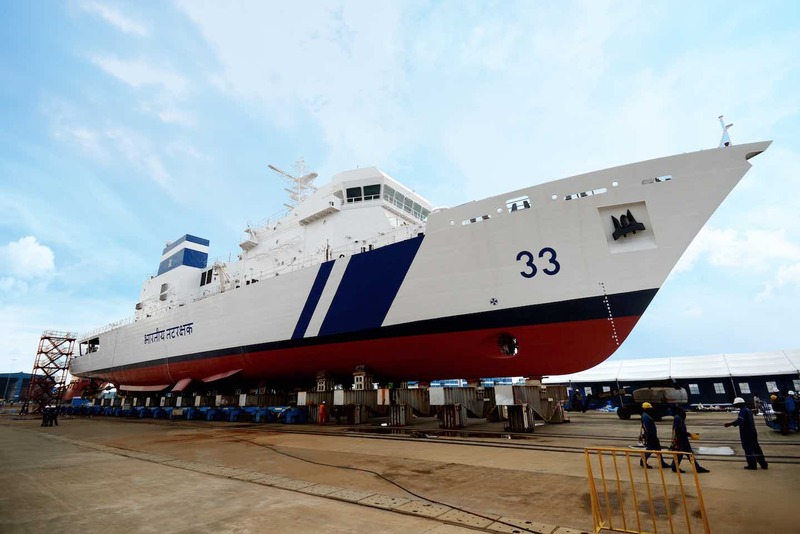 Meanwhile, the first of seven offshore patrol vessels that L&T (Larsen & Toubro) is building for the Coast Guard has concluded successful sea trials. The new vessel is getting a lick of paint before being handed over on March 31. Vice Admiral B Kannan (Retired), who headed the navy’s nuclear submarine project and now oversees L&T’s shipbuilding business, points out that both vessels were completed before the contracted time and within budget – a rarity in defence shipyards. Further, both were constructed entirely in-house, and designed in L&T’s Warship Design Centre at Manapakkam, Chennai. Yet, despite conforming fully to the Make in India initiative, Kathupalli is struggling to win defence orders and the shipyard’s capacity is severely under-utilised. In three navy tenders opened in September, public sector shipyards comprehensively outbid L&T, leaving its order book worryingly depleted. In the tender for building 16 anti-submarine warfare shallow water craft (ASWC), L&T put in a bid of Rs 1,234 crore (12.34 billion). Public sector rival Goa Shipyard Ltd (GSL) quoted Rs 797 crore (7.97 billion) and Kerala state PSU, Cochin Shipyard Ltd (CSL), won the order with a bid of Rs 674 crore (6.74 billion) – a whopping 45 per cent lower than L&T’s. In the simultaneous tender for building five survey vessels, L&T quoted Rs 742 crore. 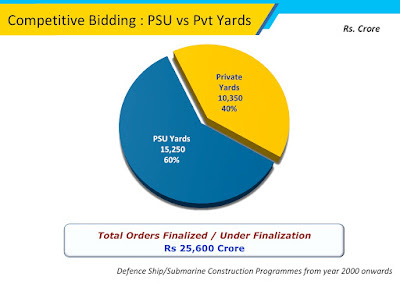 (7.42 billion) Three public sector shipyards – CSL, GSL and GRSE – bettered that with intriguingly similar bids. GRSE won the contract with a Rs 520 crore (5.20 billion) quote – 30 per cent lower than L&T’s. Finally, in the tender for building two diving support vessels, L&T quoted Rs 1,584 crore (15.84 billion). Beating it comprehensively were three public sector shipyards, CSL, GSL and Hindustan Shipyard Ltd (HSL), with the latter’s winning bid of Rs 1,010 crore (10.1 billion) being 36 per cent lower than L&T’s bid. Why did L&T bid so high? Amongst defence industry analysts, the first question this raised was: is L&T running Kathupalli so inefficiently that public sector yards can build warships 30-45 per cent cheaper than them? How did public sector shipyards win so conclusively? Confronted with that question, Jayant Patil, L&T vice president who oversees its defence vertical explained how his company structured their bids. Working off a “basic material price”, L&T added to that labour cost and services, escalation, yard recovery, working capital costs, contingencies and a provision for warranty. “Our final quote was about 1.7 times the basic material price, to cover the other costs. But our public sector competitors’ quotes were just 1.1 or 1.2 times the basic material price. Clearly, they did not need to factor the costs that we did,” said Patil. What Patil left unsaid was what everyone in the industry knows: that public sector shipyards, which get most of their income from “nominated” orders from the defence ministry, enjoy enormous financial advantages in bidding against private shipyards. DPSUs have financial buffers that accumulate from being able to cost “nominated” project lavishly, in a single-vendor environment, and obtain advance payments from the defence ministry that pile up into large cash reserves. Consequently, public sector shipyards incur no working capital costs and, in fact, earn billions in interest on their cash reserves. Last year, MDL’s cash reserves of Rs 8,363 crore (83.63 billion) generated Rs 765 crore (7.65 billion) under “other income”, turning an operating loss into a net profit. Meanwhile GRSE’s “other income” of Rs 227 crore (2.27 billion) enabled the shipyard to squeak out of the red and show a profit of Rs 12 crore (120 million) last year. Nor are PSU shipyards burdened with infrastructure costs, since those have been built up over decades with taxpayers’ money. In contrast, private shipyards like Kathupalli and Reliance Defence’s shipyard at Pipavav, Gujarat, must service debt of Rs 50-100 billion (5,000-10,000 crore), which drives up their bids. The cost of commercial borrowings, which exceeds 15 per cent per annum, amounts to over 40 per cent of the cost of multi-year shipbuilding contracts. Also allowing public sector shipyards to get away with quoting low is the permissive oversight of the defence ministry, which has never penalised them for time and cost overruns. Parliament’s Standing Committee for Defence reports show CSL’s budget to build an indigenous aircraft carrier swelled 593 per cent from the originally sanctioned Rs 3261 crore (32.6 billion) to Rs 19,341 crore (193.4 billion), while the build time rose by six-nine years. Similarly, in Project 15A to build three destroyers, MDL’s cost burgeoned to Rs 11,662 crore (116.62 billion), 325 per cent of the originally sanctioned Rs 3,580 crore (35.8 billion). In many such cases the defence ministry justified, and quietly paid, the excess. Private shipyard executives are confident that, with adequate orders, they can stabilise their finances and compete on equal terms with the DPSUs. But the high-value contracts for capital warships – corvettes, frigates, destroyers, aircraft carriers and submarine, with their advanced sensors and weaponry – are “nominated” to DPSUs. The defence ministry says this is because private shipyards have no experience of building capital warships. Arguing that private yards should “build their skills in a graduated and calibrated way”, he said private shipyards would be allowed to compete for building the eponymous Next Generation Missile Vessels, for which the tender is soon expected. Meanwhile, GSL is being entrusted with building the Krivak III frigates, even though it has never built a frigate before. “Different logic for the public and private sector”, rues a private shipyard executive. This is not the first time GSL has benefited from ministry largesse. Manohar Parrikar, as defence minister in 2015, did his home state shipyard a favour by “nominating” it for a Rs 32,000 crore (320 billion) order to build 12 minesweepers – a contract worth 30 times GSL’s turnover. Since then, GSL has made little progress in discharging the order. While the combined turnover of five public sector shipyard for the year ending March 31, 2017 was Rs 8,185 crore (81.85 billion), their order book adds up to Rs 180,000 crore (1,800 billion) – that is 22 years of production. Defence ministry officials, in public interactions with industry, claim the days of “nomination” are over, and that public and private shipyards now compete on equal terms. But the figures tell a different tale, in which public shipyards feast at the high table with the defence ministry, with only scraps being tossed to private shipbuilders. 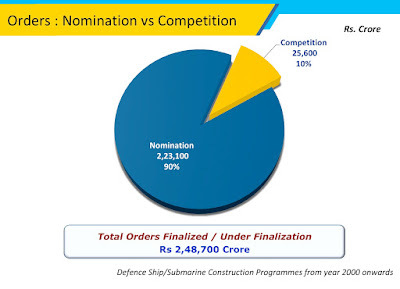 A Business Standard analysis of shipbuilding orders in the last twenty years indicates that 90 per cent by value, worth Rs 2,23,100 crore (2,231 billion), were “nominated” to public shipyards, while private shipbuilders were allowed to compete for contracts worth only Rs 25,600 crore (256 billion). Even for that tiny slice of the shipbuilding pie, private shipyards had to compete with the DPSUs, eventually winning contracts worth only Rs 10,350 crore (103.5 billion). “We don’t need orders for Rs 100-200 crore (1-2 billion) vessels. We have invested Rs 5,000-10,000 crore (50-100 billion) into state-of-the-art shipyards. We need commensurate orders,” private shipbuilders have repeatedly told the ministry, to no avail. In December, navy chief, Admiral Sunil Lanba, said: “We have also identified about Rs 40,000 crore (400 crore) worth of [shipbuilding] projects for private shipyards”. But the wait continues. Lanba stated that 23 private sector shipyards are qualified for defence shipbuilding. Amongst these, there are just four shipbuilders -- L&T, Reliance Defence, Bharti and ABG. The others, some of which have potential, are really boat building yards. Of the four large, private shipyards, two – Bharti and ABG – are insolvent, and there is little serious interest from buyers. The other two, L&T and Reliance Defence are kept afloat by their parent companies’ deep pockets. According to Parliament’s Standing Committee, the defence ministry has 53 warships and six submarines in the procurement pipeline. This number could increase if the government utilises shipbuilding capacity to build naval craft for our regional maritime partners. How these orders are distributed and tendered could determine the future of India’s private warship building industry. Nicely put! Factually correct but we have to find another way. Corporatisation of DPSU is one of the many. MoD has to do hand holding of select pvt players for long period say 10 yrs or so, Rather than open competition for Naval ships/carriers long partnership will be fruitful. Unfortunately we hv little expertise on these but such measures or combination of the above will see us through in next 10-15 years. China took more than 15 years to reach present state. Hopefully Govt/MoD will listen & ppl aupport. Another excellent article from Broadsword bringing enlightenment to taxpayers like myself. To to sum up his underlying message. When the government subsidises its own shipyards it it undermines the market-based entrepreneurship of the private shipyards. Most of India’s technological and industrial advances have come from innovative private businesses in competitive markets. Indias long-term economic growth has come NOT from existing large corporations in the Public sector but from entrepreneurs creating new businesses and pioneering new industries. Such entrepreneurs have often had to overcome formidable barriers, put in place by bureaucrats/politicians in favour dominant public sector business. This is beautifully illustrated in this article by Broadsword. If this is the state of affairs, why should private capital invest in India’s shipbuilding sector? Even companies like Reliance have been subsidised by preferential treatment, giving them an unfair competitive advantage over the small entrepreneur. The former Chai Wallah himself and the hardworking self employed Pokada wallahs were NEVER subsidised. Ask the Prachark what would have happened if the tea sellers from the cart opposite to his, had been given a taxpayer subsidy. You need to buy a car. There are two dealers offering the very same car. One is 30-50% more expensive than the other. The dealer offering the more expensive car explains that he is more expensive because he just setup shop recently and cannot match the resources of the established dealer. The new dealer also pleads that he spent a lot of money setting up shop and he has employed several people who will lose their jobs if you don't buy the car from him. So, will you spend your money to buy the car from the more expensive dealer? The answer is hopefully a no-brainer. L&T (through Ajai Shulkaji) is telling the govt to do just that. Reliance shipbuilding yard is not capable to build defence ship, better government can block them from bidding. Actually this is the irony of our country. We make private companies compete with government agencies. Private is driven by market forces and has no capacity to risk capital. However deep pockets they may have, their pockets cannot be deeper than government coffers. If private looses money they loose their jobs. Whereas government agencies thrive on government coffers, they bid at lower than market costs. As they would not loose their jobs even if they make a looking bid at expense of government coffers. The only solution is to make only private compete among each other and not with government agencies. Reliance loosing their experienced shipbuilding staffs due to poor yard top level management. Almost 90% of skilled experience staffs relieved due to worst yard top level management. Defence ministry should think wisely before allowing reliance for defence ship bidding. Also yard is in severe financial crisis, even contractors are not paid for more than a year. one more and most important reason...Politicians can have a say in the functioning of PSU like they can influence them to select a particular sub-vendor or hire a particular person..which is difficult if not impossible in private sector..
Pl consider the fact of cost & time over runs as mentioned in the article, "allowing public sector shipyards to get away with quoting low is the permissive oversight of the defence ministry, which has never penalised them for time and cost overruns. Parliament’s Standing Committee for Defence reports show CSL’s budget to build an indigenous aircraft carrier swelled 593 per cent from the originally sanctioned Rs 3261 crore (32.6 billion) to Rs 19,341 crore (193.4 billion), while the build time rose by six-nine years. Similarly, in Project 15A to build three destroyers, MDL’s cost burgeoned to Rs 11,662 crore (116.62 billion), 325 per cent of the originally sanctioned Rs 3,580 crore (35.8 billion). 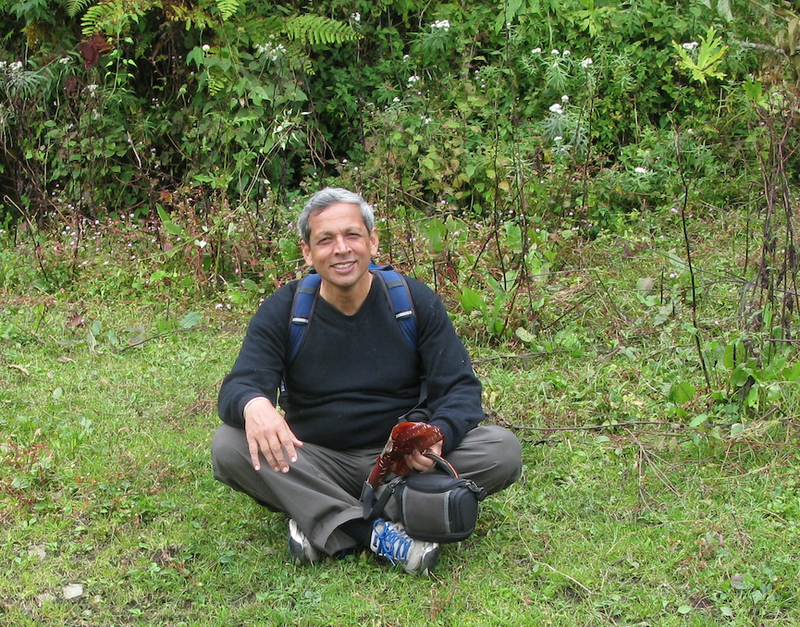 In many such cases the defence ministry justified, and quietly paid, the excess." I have sympathies with Larsen & Turbo a company that has come a long way under its present Chairman. I agree with a previous poster that this is a great article by the author, the unfair subsidy is driving dynamic private companies out of business. Reliance on the other hand has the government in its pocket. They are known to receive preference in other areas of their business, so no sympathy for the Adani’s and Ambani’s of this world. Yes when the Chaiwallah was in the tea business he would have got a shock, if his competitors had been subsidised. Chaiwallah would have in all probability have had to shut down his tea business. This article seems to forget that the private shipyards did take orders on unrealistic prices when MoD started the process of tendering and ordering of war ships. The orders for NOPV taken by Pipavav ( Reliance) and the orders of Coast guard OPVs and Interceptor crafts by L&T were taken at very low prices against completion with public sector yards. How does Mr Ajay Shukla explain these orders ? While nobody is against the private sector, it must be clearly understood that private sector cannot be brought up by destroying public sectors. In case of the LPD for the Navy, public sectors were kept out of the tender. The result is well known. The tender is yet to be concluded after 6 years. I must also say that the reasons why the nominated orders are delayed are due to changing requirements of the Owner and not due to any improper shipbuilding by the PSUs. Also the cost increase is due to preliminary estimates being used at the time of ordering the ship , which get revised as the project design and building progresses. This is common and is the same in all the countries building the first of a series of ships. Such method cannot be applied with a private sector company and therefore using this explanation to say that private shipyards are denied opportunities is not correct. In short, the private industry should stick to what they are good at , and not complain when the going is tough for them. There were no complaints from them when they took orders from MoD at unrealistic prices three years back. I am also sure that there would have been no complaint, if the LPD were given to L&T keeping out all the PSUs. Most of the PSUs have worked for years to achieve the expertise and establish themselves in the industry. It is unfortunate that new players feel that are equal champions on day one just because they have established some infrastructure. PSUs are set up in the country for a specific reason. Comparing them at par to private industry, which does not have to follow any Govt guidelines like RTI, CVC etc is totally out of context and Mr Ajay Shukla should keep this in mind. Sorry you are awfully wrong. Seems you are blind to the fact that these DPSUs are bailed out with 500 to 800 % increase in to their original quote. And what about the time over run?? A great article with indepth analysis.A segment which could have been included is the huge operating and maintenance cost of the Ships made by Govt Shipyards. The inherent disadvatages of selecting and ordering Material on L1 basis alone and the very wellset nexus of suppliers and the Purchase Depts of Shipyard ensures Substandard material like Valves and fittings etc being used in these ships. The major equipments are all nominated carefully but the part left to Shipyards discretion is of Poor quality. The consequent results are frequent short refits ,long planned refits and poor system health in the ships. Specially Ships engineering systems like Seawater,firemain,Cooling water and their Valves and Fittings suffer from these poor quality. The life time cost of Ships built by DPSU sHIPYARDS NEEDS TO BE ANALYSED for a correct assessment. In the last DCNS assisted Submarine project MDL achieved a very poor and low level of Make in India components inspite of the delay. If every thing had to come from France ,why make in India. Govt Shipyards need to be privatised and to compete on even terms . The car will be delivered at 500% percent cost after 4-5 years of promised delivery and technology as old when conceived. It is a pity that people compare the gov't coffers and benefits to that of private entities and still want them to match costs. Seems like MoD wants the situation to remain the same... Recent decision of awarding P 75i, which was reserved for private shipyards, to MDL on 'nomination' basis proves just that! The big ticket projects are meant only for the public sector come what may... It's just a matter of time till we get to hear that the LPD project has also been awarded to a PSU on 'nomination'.. Well done MoD!! !